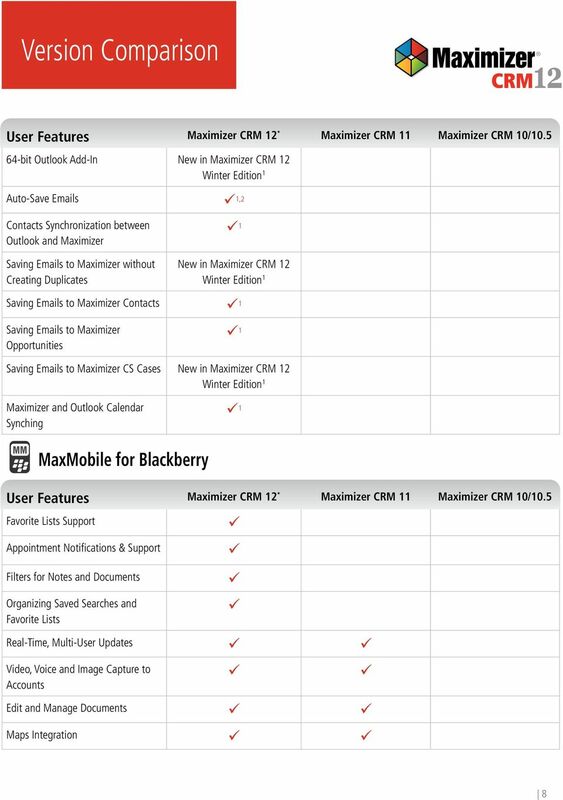 Download "Version Comparison. 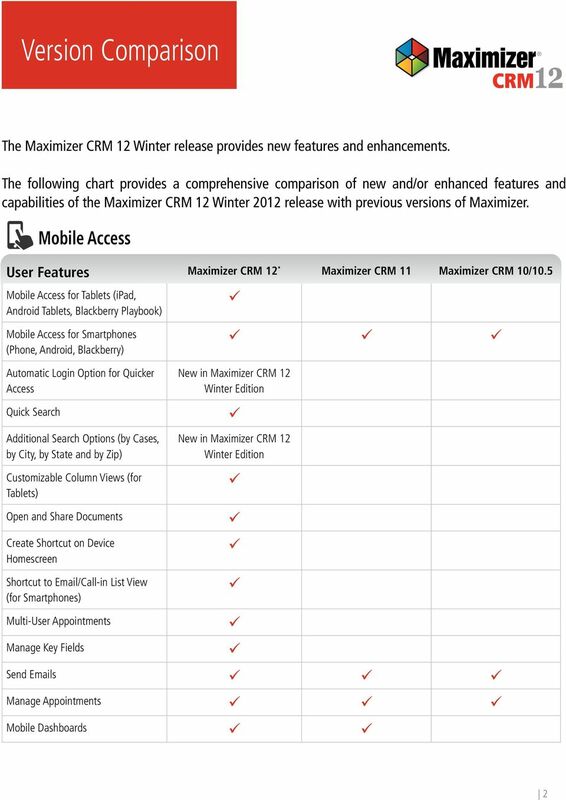 Maximizer CRM 12 Winter Version Comparison Chart. 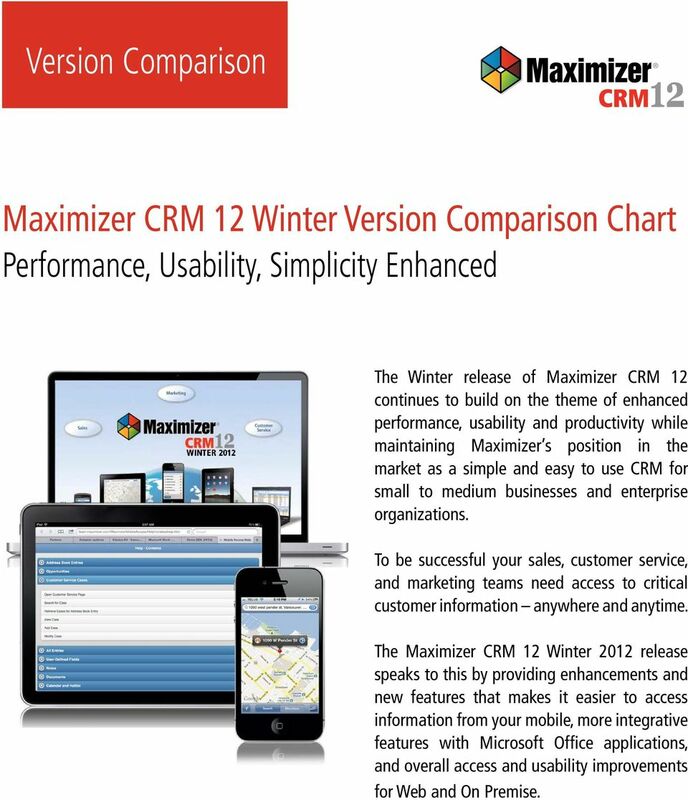 Performance, Usability, Simplicity Enhanced"
1 Maximizer CRM 12 Winter Version Comparison Chart Performance, Usability, Simplicity Enhanced The Winter release of Maximizer CRM 12 continues to build on the theme of enhanced performance, usability and productivity while maintaining Maximizer s position in the market as a simple and easy to use CRM for small to medium businesses and enterprise organizations. 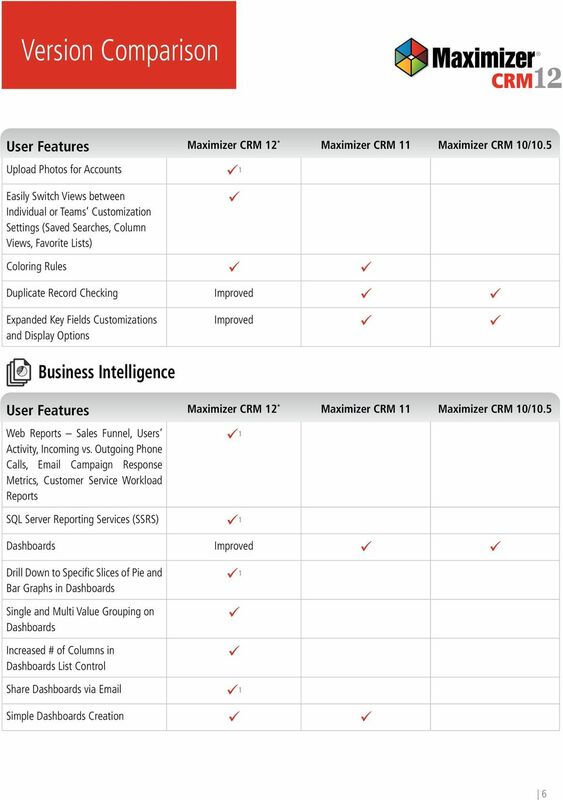 To be successful your sales, customer service, and marketing teams need access to critical customer information anywhere and anytime. 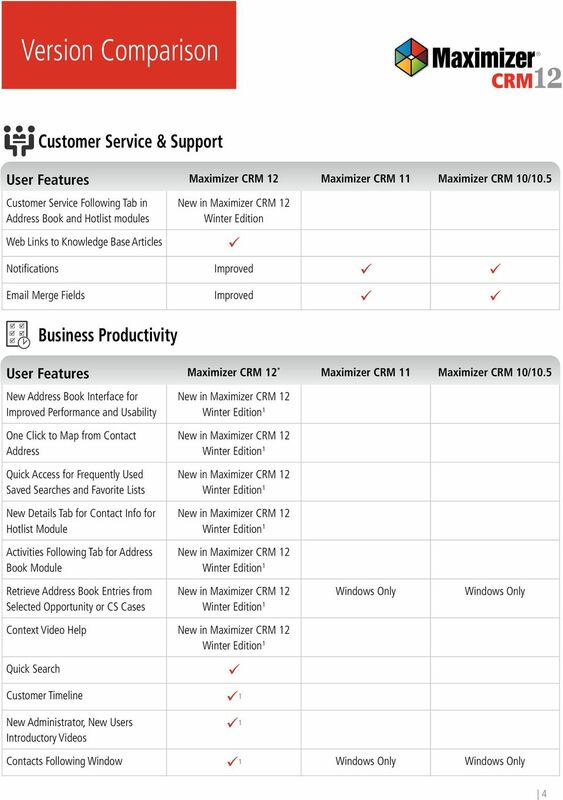 The Maximizer CRM 12 Winter 2012 release speaks to this by providing enhancements and new features that makes it easier to access information from your mobile, more integrative features with Microsoft Office applications, and overall access and usability improvements for Web and On Premise. 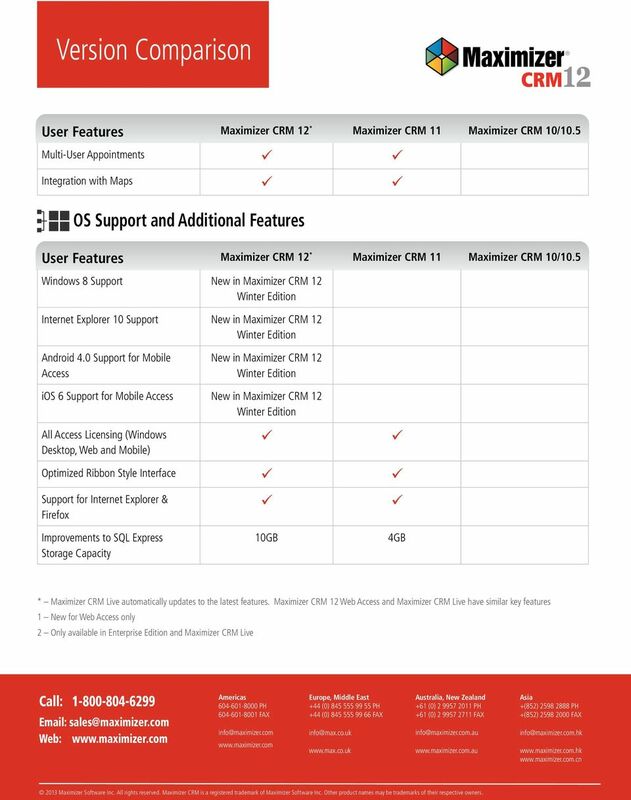 9 Multi-User Appointments Integration with Maps OS Support and Additional Features Windows 8 Support Internet Explorer 10 Support Android 4.0 Support for Mobile Access ios 6 Support for Mobile Access All Access Licensing (Windows Desktop, Web and Mobile) Optimized Ribbon Style Interface Support for Internet Explorer & Firefox Improvements to SQL Express Storage Capacity 10GB 4GB * Maximizer CRM Live automatically updates to the latest features. 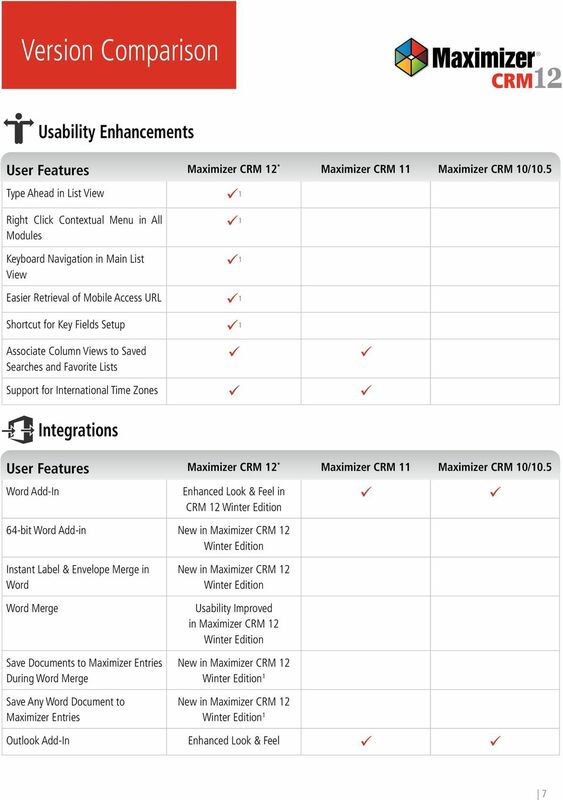 Maximizer CRM 12 Web Access and Maximizer CRM Live have similar key features 1 New for Web Access only 2 Only available in Enterprise Edition and Maximizer CRM Live Call: Web: Americas PH FAX Europe, Middle East +44 (0) PH +44 (0) FAX Australia, New Zealand +61 (0) PH +61 (0) FAX Asia +(852) PH +(852) FAX Maximizer Software Inc. All rights reserved. 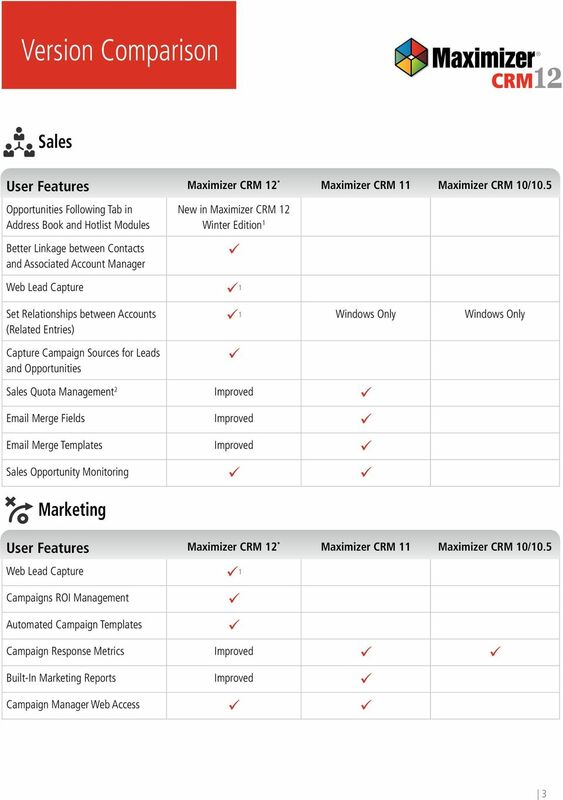 Maximizer CRM is a registered trademark of Maximizer Software Inc. Other product names may be trademarks of their respective owners. !!!!!! !!!! Request for Proposal for a Cloud Based! Learning Management Solution! Sample Questions for a! 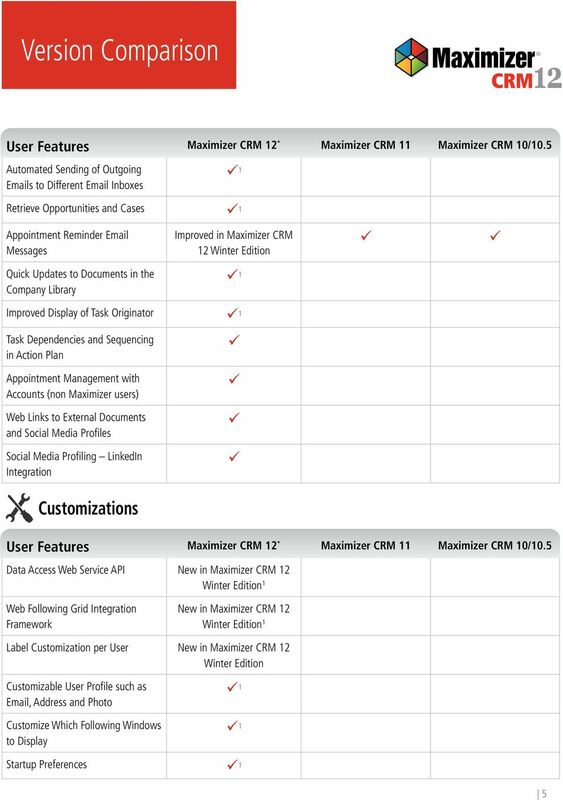 Learning Management System (LMS)! 2015 Microsoft. All rights reserved.